Vince Dooley achieved football immortality for his 25-year stint as the head football coach at Georgia, winning one national title and six SEC championships. If there were a Mt. Rushmore of SEC coaches, the face of Vince Dooley would be etched on it. But to think of him merely as a coach does disservice to the man he is. ATHENS, Ga. – Life is a masterpiece. In 1980, Vince Dooley received a phone call from a group of Mobile nuns. The call came on the eve of the national championship game pitting Dooley’s Georgia Bulldogs and the Notre Dame Fighting Irish. The nuns, whom Dooley had known since childhood, were effusive in their praise for the Mobile, Ala., boy who had grown up and was now standing on the precipice of glory. “Oh we’re so proud of you, Vincent!” the nuns gushed. Then the nuns wondered if Dooley might score them tickets to the game. Arriving the morning of the game, the Sisters ran in the room and threw their arms around Dooley in adulation. He gladly handed over the tickets as the nuns said their goodbyes and began for the door. Now, almost 40 years removed from that moment, the demigod of Southern football sits on a sofa in his Athens man cave, the remnants of his inalienable coaching life surrounding him: hundreds of miniature bulldogs in various sizes, portraiture hanging on walls, framed programs and signed 8x10s. On a coffee table rests The Legion’s Fighting Bulldog, a thick compilation of letters by Lt. Col. W.G. Delony, a Civil War soldier considered the first Georgia bulldog, edited by none other than Vince Dooley himself. When Dooley speaks, his voice has an aristocratic quality: a scratchy, plantation timbre that harkens to the Old South. There is something majestic about him, almost regal, and as he tours his great-columned home and the gardens along its perimeter, it is clear that here, Dooley has found peace. Perhaps the more natural telling of Vince Dooley’s story would involve a step-by-step chronicle of his life, from the streets of Mobile, where, as a boy, he used to draw up plays between cars; to the oaks of Auburn, where he quarterbacked the team from the “loveliest village on the plains,” became a coach, and met the love of his life. Then on to Georgia, where he first ingratiated himself with the history of the program, reading up on men like Charley Trippi, Frank Sinkwich and Wally Butts, before leading his team out of muck of mediocrity to success at the highest plateau, becoming a Georgia man for life. And from Georgia to this man cave, where bronzed heads of trophies stick out like humanoid pillars, where knick-knacks and encased memorabilia, now fading and yellowing, are housed. But the more fitting illustration is made through a series of vignettes, moments adding tiles to a beautiful mosaic patched together systematically for over eight decades. The great games in which he participated — the joy of victory and the anguish of defeat. And people: individuals who came within his orbit that made his time richer, fuller. The life of Vince Dooley evokes certain themes: Love, Commitment, Loyalty, Laughter, Integrity, Hard Work, Humility, Preservation, Knowledge and Winning. He is a serious and intriguing man but doesn’t take himself too seriously. He once shaved his head in an attempt to motivate his team. Three months later, they paid homage by bringing home the 1976 Southeastern Conference crown. Cloistered now in this verdant nook of Athens a mere two miles from Sanford Stadium, Dooley has downsized his life to speaking engagements, gardening, exercising, reading, writing, and traveling. He admits he doesn’t frequent fine restaurants, preferring to eat at home. A lifelong learner and historian, Dooley enjoys watching lectures called “The Great Courses” during his daily exercises, sponging up knowledge in disciplines ranging from philosophy and European history to cathedrals and the Civil War. A world traveler, Dooley schedules a cruise with his family every other year. His voyages have taken him to South Africa, Italy, Alaska, Poland, China, Japan, the Panama Canal, the Mediterranean, and every section of France including the most recent, Bordeaux — “a great wine region,” he says. Dooley is a man of faith and prayer, the haphazard statues of saints dotting his lawn a reflection of his Catholic faith. He is enthralled with the personalities of American History, and believes perhaps the most intriguing of all is Theodore Roosevelt. 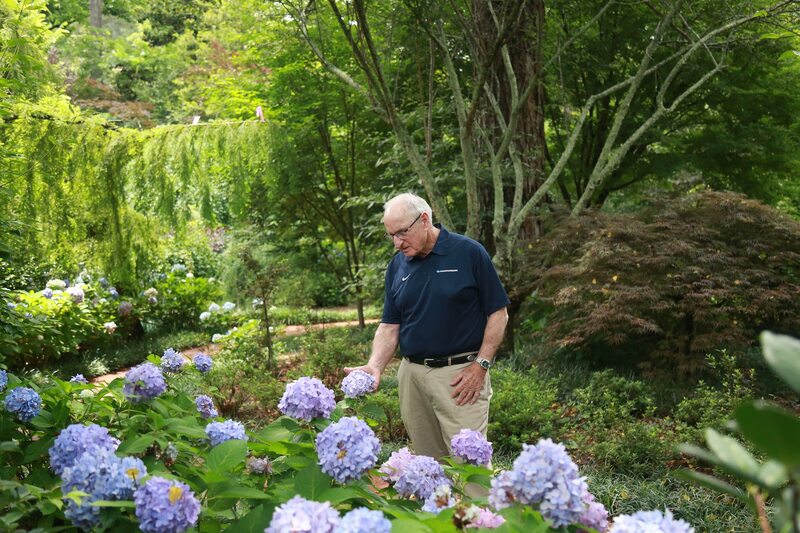 At home in Athens, Vince Dooley says “gardening is my golf.” Photo by Al Blanton / Saturday Down South. His 84-year life bursting with abundance, Dooley has lived completely. He has shaken hands with famous entertainers, U.S. Presidents, and the Prince of England; he’s hoisted championship trophies; he’s remained faithful to the same woman for 58 years; he’s authored books on a range of subjects, carried the Olympic torch and chaired a Civil War Trust that saves battlefield lands dating back to the Revolutionary War. He serves as Chair of the Georgia Historical Society and is a lifelong Rotarian. He spent five years as a consultant for the upstart Kennesaw State football team, now in its third season. He has spoken before thousands, rapt at attention, all across the United States. He has lived at the same address for more than half a century. His life reads like a fiction novel, only stranger. A dynamic supporting cast will fill his pages: a grizzled, cigar-chewing Minnesotan named Munson; a once-in-a-generation running back named Herschel; an Italian barber named Salvadori; a priest/mentor named Father Gus; and a doting wife named Barbara who has more personality and scrap than a Swiss Army knife. Then there are the football coaches with whom he once shared the trenches. Listen to their names: Bear, Shug, Erk, Dog Brewer, Holtz, Bowden, Vaught, Majors, Dye, Sherrill and Joe Pa. And the players he once coached: Happy Dicks, George Patton, Jimmy “The Greek Streak” Poulos, Little Bobby Etter, Mike “Moonpie” Wilson, Ben Zambiasi, Bill Goldberg (yes, that Bill Goldberg) and Buck Belue. Dooley has drawn from the cisterns of human experience such that he makes life look like an art form. 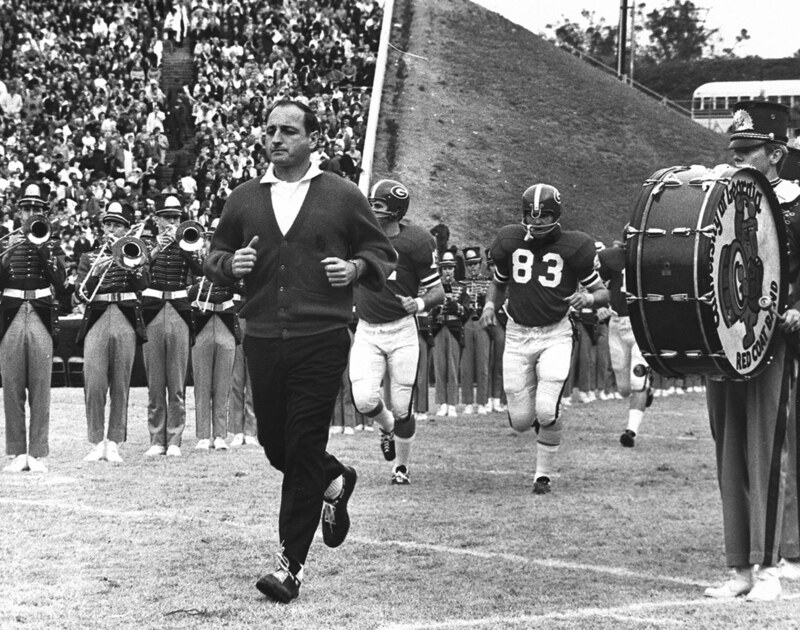 For 41 years of his life, Vince Dooley patrolled the Georgia campus, his duties overlapping for a decade, as from 1964-1989 he held the position of football coach, and from 1979-2005 the position of athletic director. Although there were many suitors along the way, there were only two instances when the bonds of Dooley’s loyalty to this great Southern institution were seriously threatened, when the gusts of fate could have blown in a different direction. For many, Vince Dooley remains the face of Georgia football. Photo courtesy of University of Georgia Athletics. The first occurred in the winter of 1965, when administrators from the University of Oklahoma invited him to campus. Dooley, just off an injury-plagued 6-4 campaign, was a hot commodity, while Oklahoma was two years removed and limping from the exodus of Bud Wilkinson, who had cemented his visage on the Sooner relief by winning three national championships and fourteen conference titles. “At first, I was not really that interested,” Dooley recalls. In his early days of coaching, Dooley had scouted and studied various coaches: Bear Bryant, Maryland’s Jim Tatum and Wilkinson, among others. “Bud Wilkinson was, early on, a hero,” Dooley said. Upon his return to the Georgia campus, Dooley received an outcry of support. Ultimately the sublimity of Wilkinson’s legacy, coupled with the homebound cries of the Georgia faithful, kept Dooley anchored in Athens. The second instance occurred in 1980, when his alma mater came a-calling just as Dooley was preparing his undefeated Dawgs for the national championship game against Notre Dame. Auburn, the institution in which he’d spent a decade of his life, contacted the 17-year Georgia veteran to see if he had any interest in the head coaching job after the discharge of Doug Barfield. “I hate Auburn!” 10-year-old Derek, who would later become the head coach at the University of Tennessee, submitted as his father boarded the plane to interview at Auburn. Auburn instead hired Pat Dye, a former Georgia linebacker and Alabama assistant. The Auburn-Georgia rivalry heating up after this hiring exercise, Dooley and Dye would trade punches during the 1980s until Dooley’s retirement from coaching in 1989. Dooley remained at Georgia for the next 15 years, his administration marked by the broadening of athletic programs, the expanding of Sanford Stadium, and the hiring of coaches Mark Richt, Tubby Smith and Andy Landers, the first full-time women’s basketball coach. During Dooley’s time as A.D., Georgia teams won 23 national championships and 78 SEC titles. In addition to the story of the nuns, the canvas of Vince Dooley’s life has been marked with the brushstrokes of laughter. Forever ago in a dank locker room in Nashville, Dooley gathered his team for an important announcement. The Bulldogs had just notched a win over Vanderbilt, and Dooley was ecstatic to alert his team that a true Country & Western legend had arrived to offer his postgame congratulations. “They just looked,” Dooley recalls. 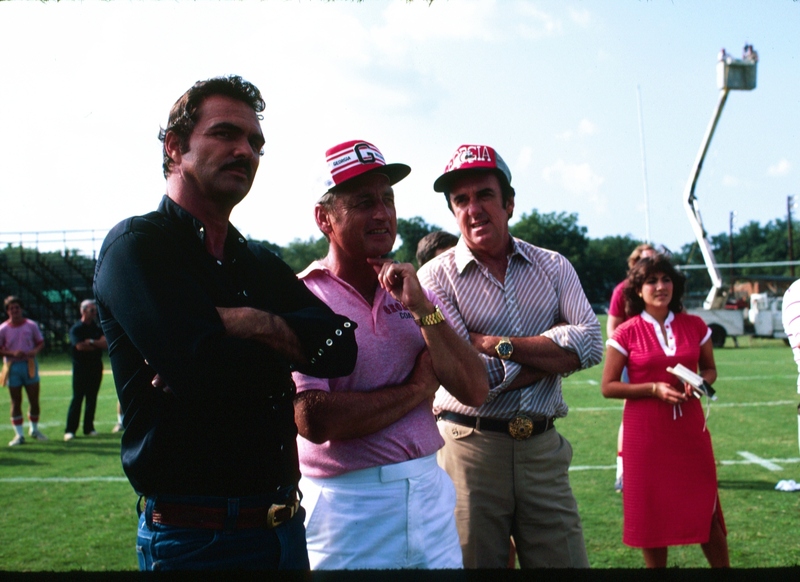 Vince Dooley enjoying practice with Burt Reynolds, left, and Jim Nabors, stars of “Stroker Ace,” parts of which were filmed in Georgia. Photo courtesy of University of Georgia Athletics. Years later, in 1976, members of the Georgia football team arrived at fall camp with immaculately sheared heads. “I went into the meeting and they had all shaved their heads, and they were all quite proud of it,” Dooley told SDS. The moxie permeating the room was such that Dooley was inspired to issue his own challenge: Win the SEC and I’ll shave my head. 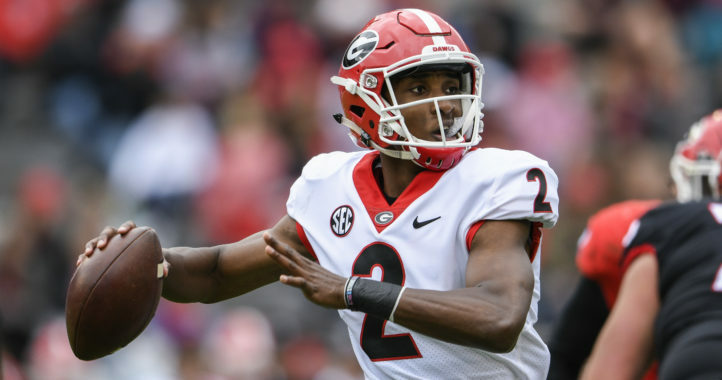 The Bulldogs tore through the SEC that autumn, their only loss a 21-17 nail-biter against Ole Miss. The team finished the regular season 10-1 and claimed its third SEC title under Dooley. Forced to make good on his promise, the ball coach for the shearing sought out an Atlanta barber named John Salvadori. “I thought he was a New Yorker and wouldn’t know me from Adam’s House Cat,” Dooley said. As it turns out, Salvadori, a native of West Blocton, Ala., not only lopped off Dooley’s hair, he found a wig that was a near-perfect replacement for the mane that now covered the floor of his shop. Dooley jammed the wig on his head and arrived at the team banquet. Receiving odd looks, he took to the dais and began to deliver a rousing speech. When he alluded to the shaving bet, the players grew tickled with anticipation. Then Dooley grabbed a tuft of wig and said, “So I want to pay my tribute and say hail to the champions!” As he yanked the hairpiece off of his head to reveal his freshly barbered coif, the crowd erupted. Erk Russell, a longtime assistant coach under Dooley whose bald dome would have made Yul Brynner envious, used this as segue for lighthearted needling. “He said, ‘Vince, you have set bald heads back forty years. Your head needs some curing. It’s white,’” Dooley recalls. “I almost broke up but managed to keep my composure,” Dooley wrote. Fortunately for Vince Dooley, the losing seasons were few and far between. In 25 tries, he had only one, a 5-6 campaign in 1977. This with a team with more “natural” rivals (Auburn, Georgia Tech, Florida) than any other school, and charged with competing in a conference with a den of “young lions,” coaches battling for wins like a slab of meat. 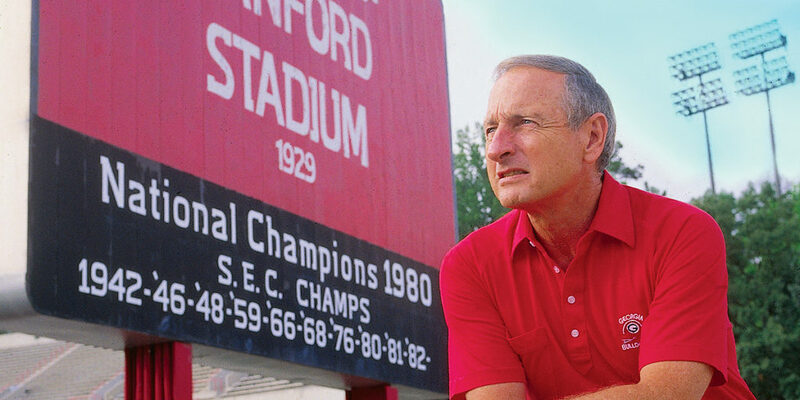 Vince Dooley won six SEC titles and the 1980 national championship. Photo courtesy of University of Georgia Athletics. There was ebb along the way, of course. 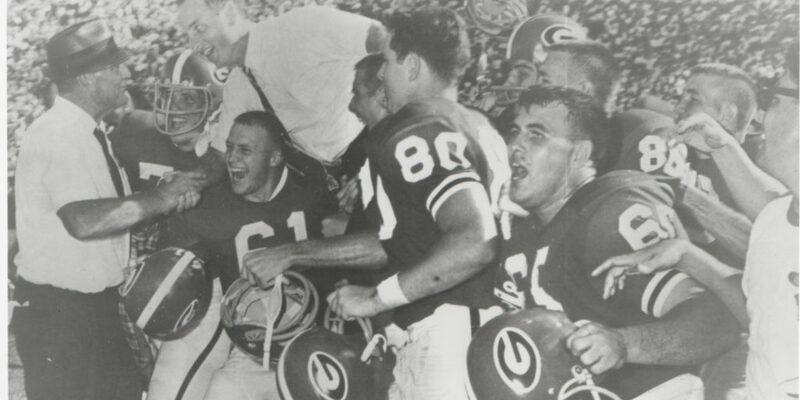 In 1969 and ’70, the Bulldogs finished with back-to-back five-win seasons. After an outlier in 1971, when the team went 11-1, the ‘Dawgs continued their flux, going 7-4, 7-4 and 6-6 while navigating the wiles of integration. But there were mostly winning years. In seven seasons, Dooley’s team won at least 10 games; in another four, they won nine. During the halcyon years of Herschel, the Bulldogs went 33-3, winning one national championship in 1980 and knocking on the doorstep of two more. They won 10 more games the year after he left, too. 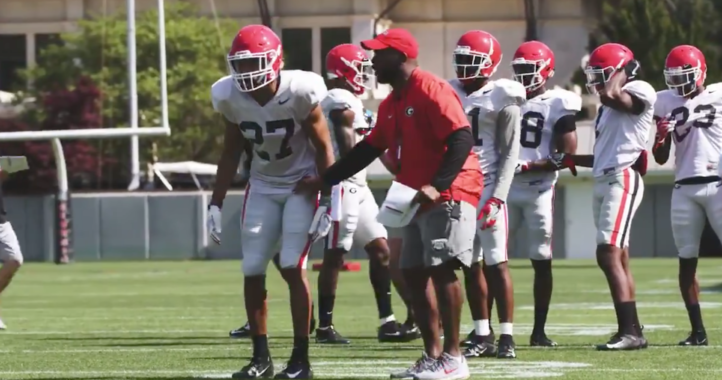 Dooley’s time at Georgia could be marked with the label “B.H.” and “A.H.” Before Herschel and After Herschel. And, lest anyone believe that the arrival of Herschel occurred by osmosis, in the 17 years prior, Dooley built a culture of winning that led to the magnificence of the early 1980s. Georgia fans will be able to recall the great games better than historians or writers peering retrospectively into the annals of lore. But for a moment, perhaps we should review a few. Sept. 18, 1965. Alabama vs. Georgia. Sanford Stadium, Athens. The turnaround officially began in 1964. From 1961-63, Georgia won only 10 games under head coach Johnny Griffith. The team had descended into an abyss before a bright young Auburn assistant coach named Dooley was hired by UGA Athletic Director Joel Eaves in December 1963. Alabama ceremoniously welcomed Dooley to the SEC with a 31-0 thrashing in his first game as a head coach. But Georgia would gather up the pieces and march on to defeat No. 9 Florida and Georgia Tech, its first win against the Ramblin’ Wreck in four seasons. Parlaying that initial success into 1965, Georgia and second-year coach Dooley faced Bryant’s Tide in a rematch, this time at a venue more suitable for the Bulldogs. 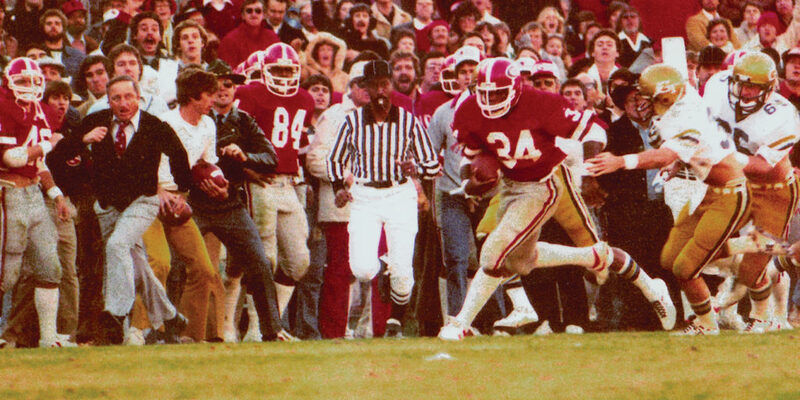 Stymied by the Alabama defense until late in the game, Georgia called a flea flicker pass, threading from Kirby Moore to Pat Hodgson to Bob Taylor, to inch within one point. A two-point conversion sealed the 18-17 win for the Bulldogs. After the game, the fedora-hatted Bryant emerged in Georgia’s locker room doorway, offering his congratulations. “So that was very, very special,” Dooley said reflectively on that moment. Bear Bryant congratulates Vince Dooley after the Dawgs upset Alabama in 1965. Photo courtesy of University of Georgia Athletics. Dec. 2, 1978. Georgia Tech vs. Georgia. Sanford Stadium, Athens. Belue led the Dawgs on a slowly-chipping-away but furious comeback. Trailing 20-7 at the half, Belue now at general, the Bulldogs scored two touchdowns in the third refrain to make it 21-20. But Tech struck back on a kickoff return for a touchdown that made it 28-21 in the Jackets favor. “Now there is no sense in going away, because you KNOW it’s not going to end like this,” Georgia announcer Larry Munson thundered from the press box. Instead of kicking the extra point to tie the game, Dooley went for two. Belue’s pass attempt fell incomplete, but flags flew in the end zone. Interference by Georgia Tech. On the second attempt, Belue optioned left and pitched to Arnold, who high-stepped into the end zone with the football raised triumphantly overhead. “I think it’s probably the greatest spectator game we’ve ever been involved in,” Dooley said. Nov. 13, 1982. Auburn vs. Georgia. Jordan-Hare Stadium, Auburn. In the calculus of determining the greatest running back in SEC history, one must take with a grain of salt the events in the fall of 1982. Auburn’s wishbone attack was spearheaded by quarterback Randy Campbell and the talented duo of Bo Jackson and Lionel “Little Train” James. Georgia was led by QB John Lastinger and the physical specimen behind him, Herschel Walker. Herschel entered the game as the fifth all-time leading rusher in NCAA history, while Bo, a freshman, was playing in only his tenth game. After a 47-yard touchdown run by Walker, Georgia led 13-7 at the break. But a third quarter pitch to the speedy James led to an 87-yard touchdown scamper that put the Tigers up 14-13. Georgia engineered a late drive, capped off by a 3-yard dance by Herschel, giving the Bulldogs the win, 19-14. With the victory, Georgia secured the SEC title and a trip to the Sugar Bowl in New Orleans. Munson marked the victory with a call for the ages, “Oh, look at the sugar falling out of the sky! Look at the sugar falling out of the sky!” while Dooley scaled the shoulders of his players. Walker, who scored two touchdowns on the afternoon, outrushed Jackson, 177 to 58. It was the only occasion Bo and Herschel ever met on the field. Jan. 1, 1981. Georgia vs. Notre Dame. Louisiana Superdome, New Orleans. None of those nights, however, could eclipse what happened on Jan. 1, 1981 when Georgia met Notre Dame in the Louisiana Superdome for the national championship. Outside of the stadium, Georgia fans reveled in the varied New Orleans seductions. Inside, it was scrapping, gnawing, ugly affair. Just the way Vince Dooley liked it. An early Notre Dame field goal attempt was blocked by safety Terry Hoage, who almost didn’t make the team bus. A fumbled kickoff was pounced on by brothers Bob and Steve Kelly. Belue struggled and was sacked four times. This was not a game defined by the box score. But in the end, Dooley’s Dawgs emerged victorious, 17-10, securing his first national championship. There are other big wins of Dooley’s tenure worth mentioning. The Big Win in the Big House, a 15-7 victory over Michigan in Ann Arbor, 1965. The 21-0 shutout against Alabama in 1976. A pair of 10-9 victories in the 1983 season: the Nov. 5, 1983 contest against Florida in Gator Bowl Stadium in Jacksonville, and the Jan. 2, 1984 Cotton Bowl victory over Texas. 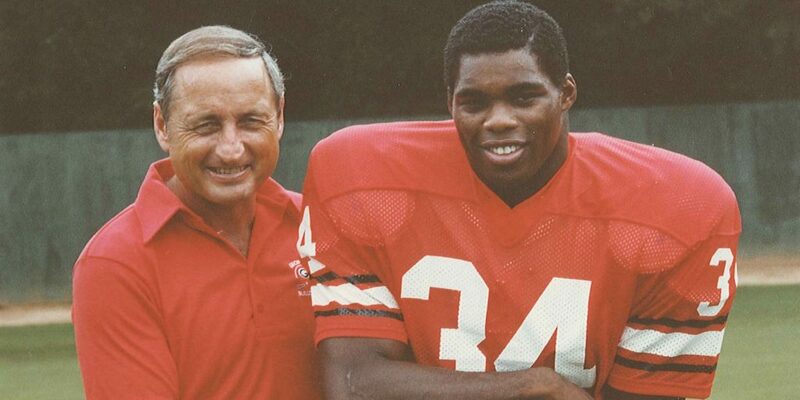 No two men in the history of the SEC are more cosmically intertwined than the tandem of Herschel Walker and Vince Dooley. It seems one cannot be mentioned without mention of the other. From 1980-82, Georgia experienced the finest years in the history of its program, as Dooley guided the phenom from Wrightsville, Ga., to a national championship his freshman season and the Heisman Trophy his junior. In total, Walker rushed for 5,259 yards and 49 touchdowns in only three seasons. He averaged an incredible 159.4 yards per game and rushed for over 200 yards on nine occasions. Staggering numbers. Georgia’s most famous duo. Photo courtesy of University of Georgia Athletics. But numbers don’t always provide the complete profile. Walker, a rare fusion of speed and power, was as feared a back as there ever was in the Southeastern Conference. It was something to see — No. 34 rumbling forward, shoulder pads wide and lowered, cutting, slashing, assaulting, and then, turning the corner as three, four, five men converge. Just when they feel they have him bottled up, he slams it into high gear, hitting the sideline, flashing past like a runaway ghost, his silver pants with red-black-and-white piping, the apoplectic fans hopping, howling, standing in awe, like depot passengers watching a train go by, and then, crossing the goal line, powering down, handing the ball to the nearest referee as if he’d been there before, as if he knew he belonged there. Touchdown Georgia. Touchdown Georgia! The site of Herschel Walker racing past and over defenders defined college football in the early 1980s. Photo courtesy of University of Georgia Athletics. Vince Dooley became a famous man for the work he did among grassy fields, where an oblong sphere was pitched and caught, where men broke and tackled. Accordingly, history will judge him as a football coach. He will be remembered through accolade and honor, by title and records, more so than the work he did to usher to hundreds, if not thousands, of young student-athletes, green with inexperience, college kids standing at the intersection of life, from the status of plebes to doctors, lawyers, CEOs, and clergymen. If history will look at him through myopic eyes, he does not use the same lens of self-analysis. He has used his renown and fortune to sample from life’s buffet of worthwhile indulgences. He served his country as a United States Marine. He is more a family man than a football man. He understands the priority of faith, and it doesn’t arrive on the line below football — or anything else. Little by little, he has systematically recused himself from public life, and as the years march by like cadets in a pass-in-review, he has found solace as a fan and onlooker to his chosen sport. Walking away from the game of football does not sting him now; he is happy with the pursuits of his post-gridiron life, the fruits of which are assorted and many. His is a life that’s won more than it’s lost. His scales will tip in favor of laughter and mirth when balanced with the dull weight of tragedy and crises. He is a man who cannot be pigeonholed into a lone category or defined by simple explanation. He is a man who marvels at the world, and at nature. He has looked at it and found it exquisite. He has made prudent use of the most precious commodity: Time. He has chosen to trade the offer of a numb, dispiriting life for one that is full and thorough. He will never go down as the winningest coach in SEC football history. Doubtless there are those who will not consider him the best. But, perhaps no one in SEC coaching history has led a more complete life than Vincent Joseph Dooley. And there is nothing more spectacular. Al Blanton is a freelance writer for Saturday Down South. Follow Al on Twitter @alblanton78. I feel Vince was a solid good coach but not an elite great coach. I say this b/c if he didn’t have Herschel then he most probably doesn’t win a national nor the 3 SEC titles when Herschel was there. That equates to 0 NC’s and 3 conference titles in 25 years. I look at Vince as I do Mack Brown…if Mack didn’t have Vince Young then Texas isn’t even in the NC game. I think its those four as well. Jordan and Vaught might have an argument as well. I always enjoyed watching coach Dooley’s Georgia teams. I lot of toughness and a lot of class. I don’t recall any scandals or cheating at the school during his tenure. You say he is only great because of Herschel Walker. Well, he recruited Walker, he built the offense around Walker. Interesting to note that he had some “off” years. Sadly today, if you go 7-4 or even 10-3 it is not good enough and the coach gets run out of town. It was a different, better time. Only one team can win the SEC at a time. Just sayin’.